The travel business, just like any other type of business, is driven by consumer demand. But consumer preferences, expectations and values are never constant, nor are they universal. When it comes to acquiring traffic organically, the travel industry is insanely competitive. For instance, according to the latest SEMrush Organic Traffic Rank report for the North American region, among the 1,000 most visited domains in Google searches, travel domains receive over 254 million visitors a month. Tripadvisor.com alone controls 45 percent of this traffic. To hone in on the features of powerful content that actually pay off, we decided to dig into the data and research what works best for travel sites. We selected the 100 travel websites with the most traffic coming from the U.S. based on data provided by SimilarWeb. Then we filtered the list to include only websites that update their blogs on a regular basis and checked how these blogs perform in terms of social shares, backlinks, and traffic. 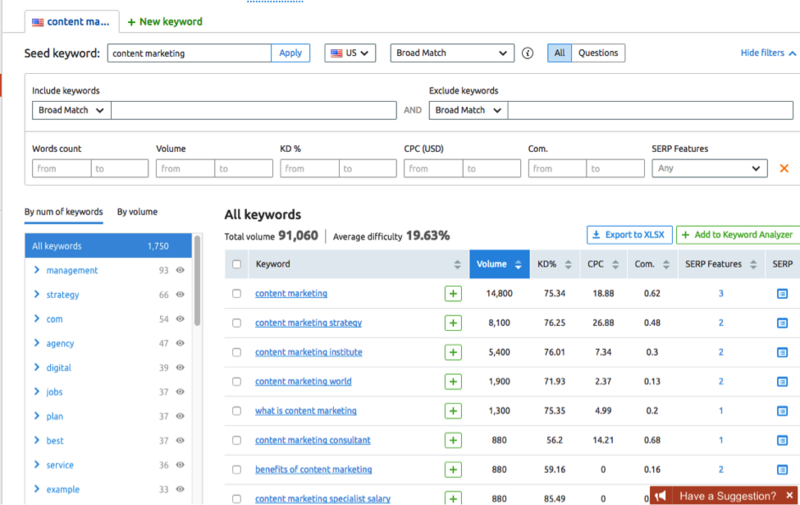 To get these metrics, we used BuzzSumo and SEMrush. In total, we examined 67, 287 content pieces published between June 2012 and June 2017. The results show what works best for the travel industry and provides some clues as to why it works. The full list of sites is included at the end of the post. Content production in the travel industry has grown exponentially over the last 5 years. On average, travel blogs now post 22 times more often than they did 5 years ago. This increased production of content has not caused an uptick in inbound links to travel sites, nor does it reduce them. 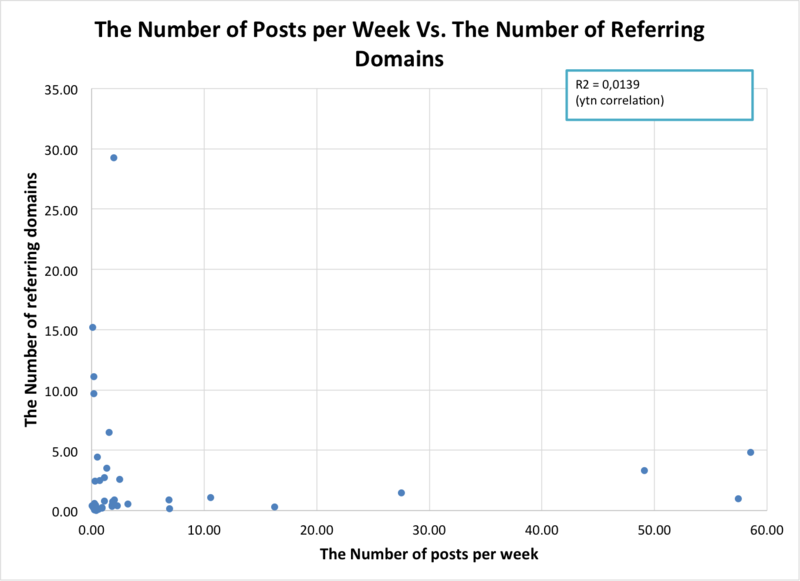 We’ve discovered no correlation between frequent posting and the number of acquired links. 96 percent of social signals come from Facebook. If you’re interested in increasing your company’s social engagement and your your company belongs to the travel niche, then you need to invest in growing your community on Facebook. If you don’t have any links, you won’t receive any organic traffic. However, we also found that the saying “the more, the merrier” doesn’t always ring true when it comes to links; if your number of linked domains increases, it doesn’t necessarily mean your page will get more traffic. 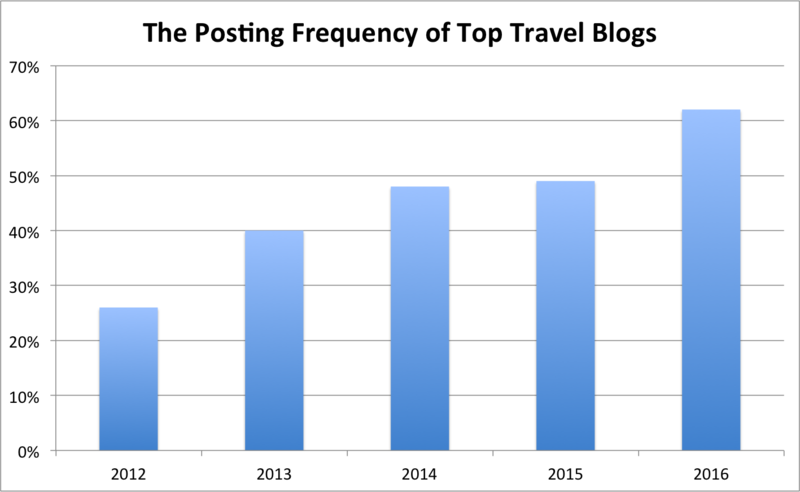 The posting frequency of top travel blogs has increased by more than 22 times in the past 5 years. After analyzing our list of websites, we found out that in 2012 only 26 percent of them published at least one post on their blog each year. From 2013 on, we spotted a healthy increase in websites with regular posting activity, increasing up to 40 percent in 2013, 49 percent in 2014 and 2015, and finally reaching 61percent in 2016. 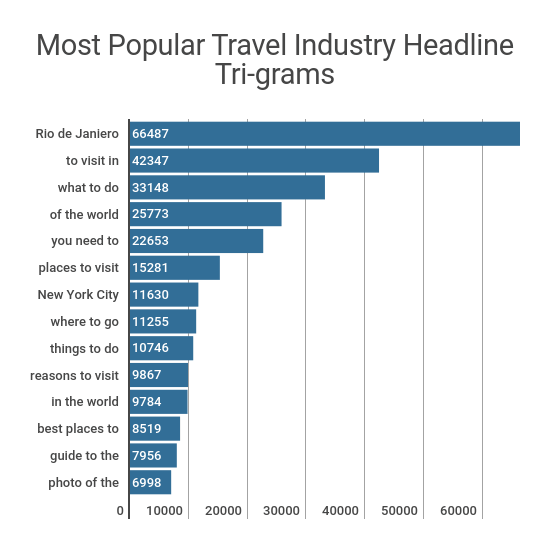 To confirm the pervasive popularity of content in the travel industry, we also looked at research by Content Marketing Institute and Marketing Profs that showed that, in 2016, 86 percent of B2C content marketers in North America said that they were actively taking advantage of content marketing. That’s 10 percent more than in 2015. Our findings about the travel industry correspond with this result. There’s no correlation between content publishing frequency and number of acquired links. We’ve discovered that an abrupt increase in blog posts doesn’t negatively affect your number of referring domains. For instance, in 2016, Kayak published 15 posts and each piece of content contained about 6 links, while Atlasobscura.co worked to produce 4,677 articles and saw nearly the same outcome regarding referring domains per post. The graph below illustrates our conclusion about the number of acquired links, compared to the number of weekly posts. Of the 67,287 posts we analyzed, 33,481 posts weren’t mentioned with links in another piece of content on the Web. This makes them less likely to get traffic or rank well on search engines. Our hypothesis is that after content marketers have rolled up their sleeves and begun content production, they tend to forget about the 80/20 rule. We need to spend less time, 20 per cent, on content production and more time, 80 per cent, on content promotion. In other words, getting your content in front of the right people is much more important than creating a lot of content. Applying the 80/20 rule to your content production process is the key to building a loyal fan base. The travel industry is not alone in its failure to gather a robust number of links with its content marketing. In fact, it’s actually performing slightly better when compared to content from across industries, according to a study by BuzzSumo which included analyzed of 1million posts. Of those, 75 percent had no external links. Link building is hard. Content publishers must be intentional about creating content that is likely to produce links. Compared to static content, interactive content appears to be much more captivating. We defined interactive content as something that requires more than just reading or watching. To illustrate, we discovered that posts that receive the highest number of links have interactive maps in which you can, for example, select the best routes described in American literature, or create a map of countries that you’ve visited. What’s even more interesting is that not only do these types of posts have a myriad of referring domains, they’ve also earned an impressive number of social shares. So if you’re interested in acquiring links and motivating your users to engage with your content and share it, your content has to invite your audience to actually do something while reading it. With the abundant presence of all sorts of information online, we are becoming more and more picky about what to share. Long gone are the days of informational scarcity. Now, people have a lot of choices about the information they rely on, and they only want to link to highly useful content. As marketers, we need to shine through the clouds of gibberish and provide users with something useful, that will make their lives a little easier. Guides supply this type of information. According to our research, posts that are written in the format of a guide, on average, have more than 29 inbound domain links. So if you’re focused on acquiring links, consider creating a guide that will reflect your audience’s interests, entertain your audience, and attract new clients. The tipping article we found does indeed answer a burning question: How much gratuity is enough in different countries? According to BloomBerry — a tool that aggregates the most frequently asked questions within an industry — worldwide travelers are actively researching the ethics of tipping. Nowadays, people are willing to prepare for their trip in advance to ensure they will enjoy their time in a foreign country to the fullest. What other types of guides could help them in their research? Using SEMrush data, we were able to investigate how the absence or presence of linked domains affects organic traffic. Our data has confirmed that there’s a very slim chance of getting enough organic traffic to rank in SERPs without inbound links. 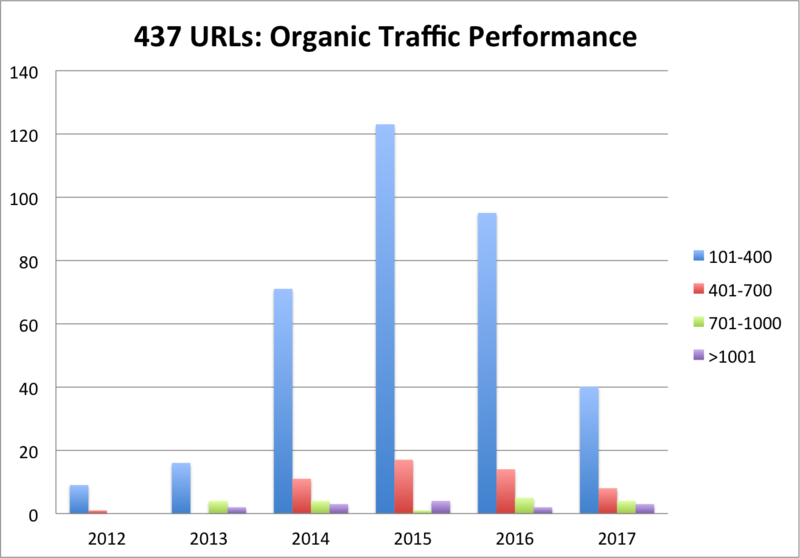 For instance, in our dataset only 2.8 percent, of the URLs we looked at had zero referring domain links AND organic traffic. But, that traffic was very low. Only 437 URL’s with zero referring links got more than 100 organic visitors a month. The graph above shows a breakdown of 437 URLs with no inbound links that still got more than 100 organic visitors monthly. The X-axis represents the date of publication, and Y-axis displays the URLs’ amount of traffic. These exceptional posts started earning traffic at the beginning of 2014, which demonstrates that the domains have a trustworthy reputation within the travel industry. In 2015 and 2016, these posts began showing up in search results more frequently, and, as a result, started attracting more traffic. The results from 2017 may indicate a delayed positive effect. Please note, in our research we concentrated on the most visited travel industry sites in the U.S., and these sites have tons of links and a strong brand authority. That’s why some pages might rank surprisingly well in Google even with no external links. Some time ago, together with Travelpayouts, I conducted another research project to analyze both top-notch travel websites and small- and medium-sized domains. We discovered that the minimum number of referring domains should be between 130 to 140. At that level, you should begin receiving anywhere from 1,000 – 2,000 organic visitors monthly. However, using the current data sample, I’ve noticed that the minimum threshold may be lower. You’ll only need about eight referring domains per page to get 200 organic visitors. As you consider these numbers, remember that if your domain can’t boast an outstanding backlink profile, then you’ll have to do some leg work to acquire any links. What this means is that the content being produced oftentimes doesn’t bring a steady flow of traffic on a daily basis. And even if we assume that some of the posts had a purpose other than driving traffic, there are still a lot of articles that are popular among readers for only a day thanks to social media shares. That type of fame disappears as fast as it started. Content marketers need to remember that both shares and links are necessary to keep brands and content top of mind. Companies really can’t afford to generate content that doesn’t find its readers. Frankly, this was an astonishing fact to stumble upon, because I was sure that the more links a site had, the more organic visitors would be directed to the site. However, we shouldn’t forget the fact that the amount of traffic also depends on the search volume of the keywords for which your site appears in Google. Please note that we didn’t take into consideration a great deal of other on-site ranking factors like the number of visitors, bounce rate, time spent on page, HTTPs, and other that definitely impact the overall performance of pages in Google. The travel industry is mainly focused on the B2C market, and that’s why Facebook is bringing so much engagement to the table. Brands that are struggling with the level of their audience’s social engagement should pay a close attention to Zuckerberg’s creation. LinkedIn didn’t drive many shares for the travel industry. That’s an outrageously small number, and it proves that travel industry has a very high social engagement in general. We checked 5071 post titles that have gained more than 3,000 social shares to find out which posts perform better on social media channels. ‘How-to’ posts appeared 177 times in our sample, ranking fourth among the top phrases with two words in them. List-based posts also brought a lot of social signals. Apparently, mentioning a specific number in your headline can spur much greater interest than if you mention another (e.g. ‘10 essential French phrases for travelers’, or ‘20 Most Amazing Things to Do in Thailand’). Our research also uncovered a few other common phrases. This post gained more than 191,000 social shares by listing funny French expressions and ways you can use them. I find it fascinating that another well performing post also happens to be French related, only its focus is the 10 best things to do in Paris. This post is also a list-based piece, but it’s more interactive, since it allows the reader to browse through things that are supported with the photos of places and a short description. Identifying popular three-word phrases, tri-grams, in headlines can help refine your search for keywords for your post’s heading, and will also help your post to perform better on social media. We analyzed the 40,000 most socially shared posts about traveling that were published between April 1 and March 31 in 2017. We limited our research to those phrases which were mentioned in more than 50 highly shared posts. Unsurprisingly, the phrase ‘Rio de Janeiro’ is at the top of the list: the Olympic games took place within the time frame we selected. 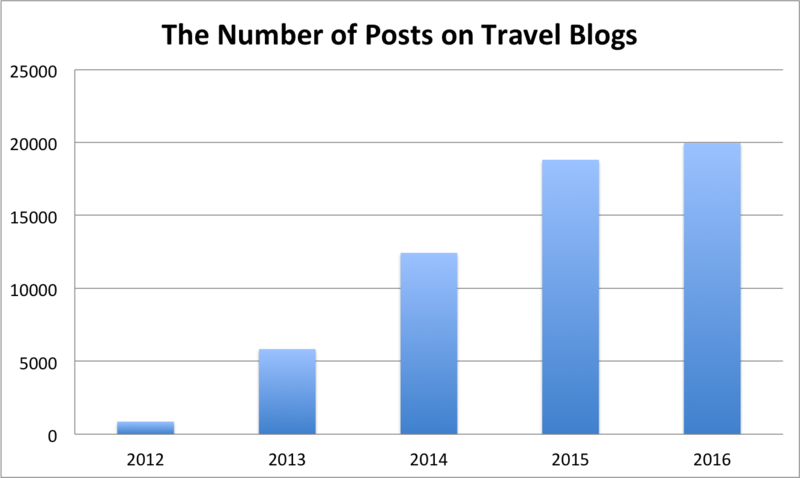 In today’s rapidly evolving environment of the travel industry, travel blogs now post 22 times more often than they did 5 years ago. But not all businesses realize the importance of content promotion, wasting time and effort on producing content that will never reach its audience. Our research proved once again that companies need to invest in creating interactive content because that gives consumers real value, with travel guides having the highest chance to get links. People want to refer to content that can be put into practice. Great guide about this big market.